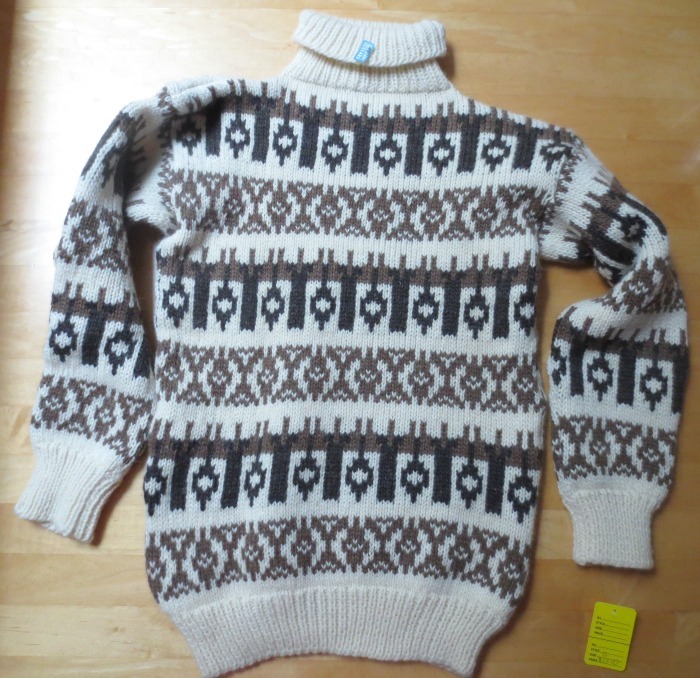 So the other day while thrifting on a mini-vacation, I had passed up buying a wonderful knit wool sweater from Iceland. Well, the sweater was bulky and I knew it wouldn’t fit in our carry-on suitcase (my husband and I were sharing one carry on…what was I thinking??). But as it turns out I was going to have to bring an extra bag of stuff on the plane anyways, so the next day I hot-footed it back to the thrift store to get the sweater. The store opened at 10:00 and I got there at 9:50 and was fifth in line waiting for it to open. As I waited I got a tad anxious. Would it still be there? Would I get it before these other ladies?? What if two of us reached for it at the same time? And then, thankfully, I got a grip on myself..if it’s gone, it’s gone. No big deal. Well when the doors opened I fairly dashed into the store and went straight to the little back room. Hallelujah! It was there and I got it! I went up to pay and one of the ladies behind the counter said, “Let’s see, sweaters are $4.” But I knew this sweater had a tag of $12. For a split second, I thought “just keep your mouth shut about the tag” but I realized I didn’t feel right doing that. It is an expensive sweater (these sell for over $100 new and this one still has a little tag from the store in Iceland attached) plus the money raised at the store “benefits ministries that address issues involving the hungry, homeless, wounded, abused and/or displaced.” So I alerted them to the price tag, paid the $12 and felt good about my honesty…until these two lovely church volunteers started chatting with me. One of the ladies asked it I was okay with wool next to my skin. I said yes. She further asked, “Even by your neck?” I thought this was a curious question, but answered yes. She then asked where I lived and when I told her Silicon Valley, she said, “You don’t have much call for a sweater this heavy, do you?” My answer, “Well, no, but this would be perfect for snow trips to the mountains.” She agreed and further went on to say that the sweater would indeed keep me warm in the mountains and how nice it will look on me. I smiled and she finally put the sweater in a bag and I was on my way. I was happy to have the sweater, glad I paid the real price, but felt a bit bad about the the conversation deception. I mean the sweater will be perfect for someone on a snow trip to Lake Tahoe. It just won’t be me wearing it. Somehow I just couldn’t reveal that I wasn’t buying this for myself but to resell. People get funny about that, particularly in these small thrift stores. There’s a perception that we are taking stuff out of poor folks’ hands or that we are somehow “cheating” by reselling the item later for a higher price. I don’t believe either of these, but I don’t broadcast my intentions either. So there it was…honesty and dishonesty at the thrift store. Would love to hear your thoughts or if you’ve had similar experiences. I don’t do much buying in thrift shops, but I do occasionally have a pang of guilt when getting a great deal. My policy has always been that when I know the asking price is beyond fair I will not try to dicker for a better price. I have probably given more than asking price a few times, but I realize that sometimes we value things differently and as long as I’m not guilty of trying to get the price lowered further I can live with getting a deal most of the time. I like your honesty. So many people would not do what you did! I could do without the thrift store staff’s conversation after the purchase though. I mean, I think you’ve bought something, it’s nobody’s business what you’re going to do with it. Even if they were well-intentioned on asking about your reaction to wool, I just see it as meddling. Maybe it’s just me. I just don’t deal with strangers asking me questions so no, I wouldn’t feel bad if I was buying something to resell. It’s a win-win for everyone.